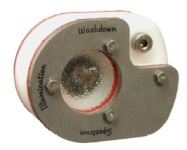 Designed for washdown environments, this light is IP68 compliant. Its enclosure is constructed of 316 stainless steel and white delrin, with a FDA compliant silicone rubber gasket. This light has been hydrostatic tested. Manufactured by Spectrum Illumination, this spot light can be used for either bright-field or dark-field illumination. It projects lots of light despite its compact housing. It can be mounted 12" to 20' from the object to be imaged. LED optics and diffuser options are available that make it possible to obtain closer working distances and/or larger coverage areas. Please contact us if you’re interested in controller options, a different diffuser material, different LED optics, or a longer cable. Window: Shower Glass Diffuser Optional thin film diffuser, white diffuser, or clear cover. Optics: 12 degree lenses Optional 30 degree, 50 degree, wide angle, or line generating lens. Cable Length: 4.0 m (13.1 ft) Optional 8, 15 or 30 meter washdown cable.